The Queen of Music Soundarie David Rodrigo delivered an entrancing performance last week at the Lionel Wendt. ‘Soul’ – An Evening of Original Music by Soundarie, was music at its best. Item after item Soundarie held the attention of the crowd in a way that only the genius of Soundarie David Rodrigo could do. Rodrigo’s hallmark is that she is a very versatile performer. Her music is unique. She was absolutely dazzling that evening. She choreographed the evening in such a way that every item blended so smoothly with each other. She has been in the industry for quite some time now and has made a name for herself as one of the most premier musicians in Sri Lanka. Always smiling and friendly she has not let success go to her head. She has always endeared herself to the audience through her genuine passion for music. This was evident at the performance. She had such fire inside her that evening. Her personality and music sent tangible waves throughout the audience. It was a truly unforgettable evening with Soundarie at the Piano. The lighting and special effects really was right up there making the evening even grander. 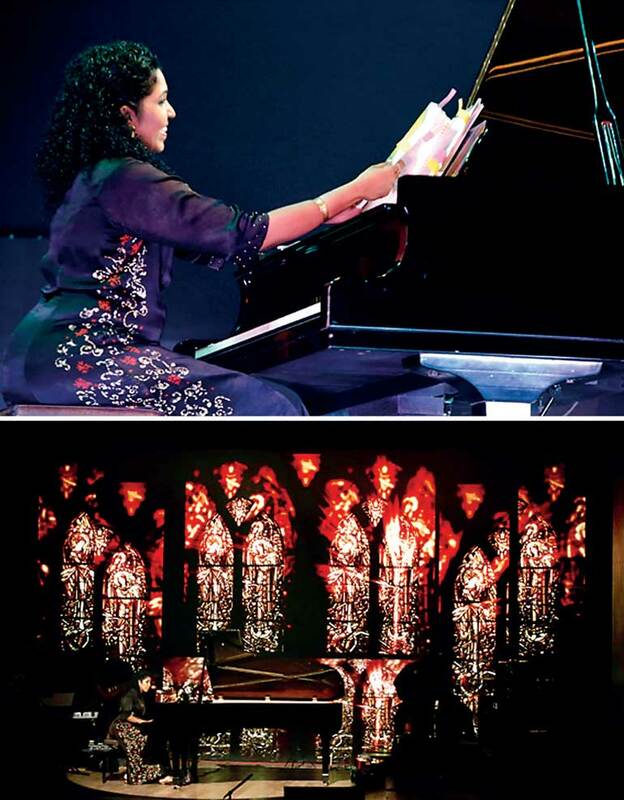 The melodies that Soundarie churned out that evening showed a class hitherto unseen before at a performance in Colombo. There was really something unique about the performance. ‘Soul Sounds’, Soundarie’s proud creation, through their sensational and astonishing performance that evening showed why Soundarie is called a genius. These were girls personally groomed by her and by their brilliance that evening, it proved Soundarie’s competence. There was a beautiful balance that evening. It was emotional for all of us. In performances like this there is that attachment between the performer and the audience. And there was a very strong attachment that day between Soundarie and her fans. If you have never heard of Soundarie before (which is unlikely) then if you were there that evening you would have instantly fallen in love with her music and with this beautiful woman. There were other performances of course – Ravibandu Vidyapathi, Dushy Perera, Bathiya Jayakody, Jerome De Silva, Shehara Liyanage and Andrew Obeysekera who thrilled the crowd. Music does so much for us – it can make us feel elated and it can make us cry. That day we were inspired. We were inspired and grateful to be alive. That is what Soundarie can do for you. She is the grand physician of music- her ability to capture our imagination. And make us think things she cannot express with her words – possibly things we cannot express with our words. Soundarie is a qualified lawyer with a masters-in-law, in the field of intellectual property and entertainment law from the University of California Berkeley. She was the Deputy Director at the SAARC Cultural Center based in Sri Lanka for the last six years and is currently the Director, programs for the Colombo Cultural Hub. Her awards include the SAARC Woman of Achievement Award, the Zonta Award and the Bunka Award.